The NKJV Study Bible: The Complete Resource for Studying God’s Word, published by Thomas Nelson, is a publication that desires to help its readers draw into a more personal relationship with God. The NKJV Study Bible helps the scriptures come to life with its fresh full-color page design and its more than 15,000 clear and understandable, verse-by-verse study notes. Turning the pages, you will find a multitude of resources designed to enlarge your faith, and obtain a clear focus. Such resources include redesigned, full-color maps and charts, Word Studies, Articles On Key Doctrines, Book Introductions, Bible Times and Culture Notes, and so much more. All in all, this is an amazing Bible, with only one exception. While the cover declares this is a personal size Bible, it is quite stout. Even so, it would make an excellent addition to any library. The 9 Arts Of Spiritual Conversations: Walking Alongside People Who Believe Differently, written by: Mary Schaller & John Crilly, published by: Tyndale Momentum, guides us into a possessing a greater technique for our outreach/witness efforts. 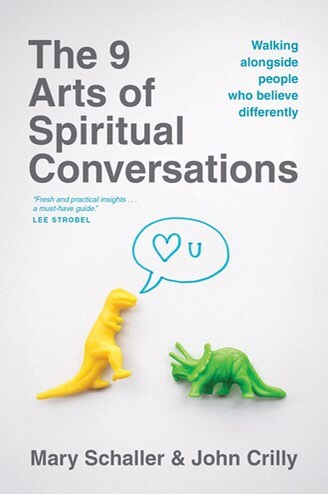 Through these three categories, through these 9 Arts Of Spiritual Conversations, and through the life and ministry of Jesus discussed in this publication, you can learn to communicate more naturally, in such a way that draws your audience into a greater understating of what your personal faith means to your existence and how Jesus can make a difference within people’s lives. If you ever wanted to be able to share your faith in a comfortable, natural manner, then this book is something that you need to purchase and pass along when you have finished reading it yourself. For that reason and so many others, this is a recommended purchase. The Gift For All People: Thoughts On God’s Great Grace, written by Max Lucado, published by Multnomah Books, is a beautifully written, thoughtful and inspirational book concentrating on the most important topic in existence, Jesus Christ. 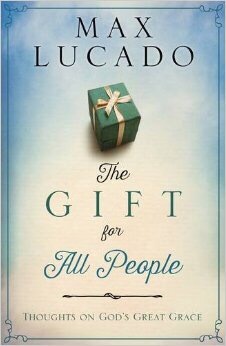 The Gift For All People is a collection of thought provoking, heart stirring, insights brought forth through the masterful writing of Max Lucado, designed to give insights into God’s role as grace-giver. Each chapter is brief in presentation, thus allowing anyone to find the time needed to read, in the least, one chapter at a time. At the close, Max brings forth a call for salvation. In doing so, he doesn’t reach around the topic, but instead is very open and forward about the necessity for salvation through the shed blood of Jesus. This book provides its readers with wonderful material that can be utilized in their study of God’s Word, thus it is a recommended purchase for personal use or as a gift. 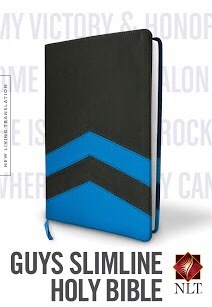 The NLT Guys Slimline Holy Bible, published by Tyndale House Publishers, is a Bible that packs enough punch to be a big hit in any Christian’s life. Inside this amazingly thin Bible, you will find a section entitled Great Verses Of the Bible, which lays out important scriptures that detail stories that are sure to change your life as they are read and memorized. Some of the topics expressed are Fear, Strength and Giving, to only name a few. The Daily Bible Reading plan allows for continuous reading/study through the scriptures which allows you to finish reading the entire Bible in just one year. Maps allow visual learning of Biblical communities, the missionary journeys of Paul, and the ministry of Jesus. This Bible is the perfect baptismal gift or a gift simply given out of love for another’s eternal placement, thus it is a recommended purchase. The NKJV Chronological Study Bible, published by Thomas Nelson, is an amazing depiction of God’s Holy Word, that sets the events in the actual order that they occurred, thus making your time studying more productive. The NKJV still holds true to the KJV while making the modern text easier to understand, memorize and share with others as you express your faith. Besides the easy to read text, another extraordinary feature is The Daily Life Notes. These notes allow you to understand exactly how people lived during the Biblical era, thus making the scriptures come alive. Time will pass quickly as you try to utilize all the tools provided in this Bible. From the Full-color Illustrations, to the Scripture Passage Index, through the Topical Index & Glossary, and so much more, this Bible is an amazing tool that every serious Christian needs to own or to hand off as a gift. This Bible is packed, from cover to cover, with the tools needed to grow in your faith and become a better witness for Christ, thus it is a highly recommended purchase.